The iPad is great for many things, but typing isn't one of them. SoundNote means that – in meetings and conversations at least – you don't have to try. Start the software, and it uses the iPad's built in microphone to record everything anyone says, which you can later export or mail out in a standard M4A file. 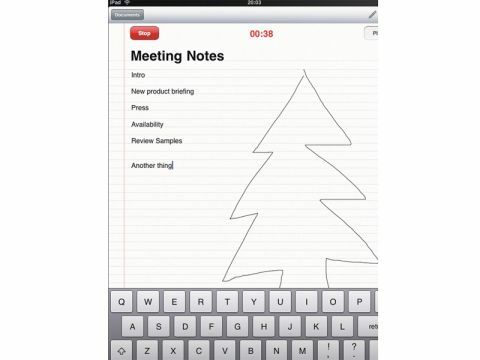 The clever bit is that you can still make notes, which then act as shortcuts to relevant points in the audio, by typing quick headings or notes using the keyboard or by scrawling quick doodles. The system works brilliantly, with the only weakness being that drawing on a touch-screen isn't much fun. It's incredibly simple to use and to experiment with – for instance, typing out a meeting agenda and underlining headings when you get to them, or taking a completely freeform approach. However, it isn't an advanced note-taking tool in its own right. There's no importing of other media, handwriting recognition or similar notetaking assistants, and the notes you take are primarily geared towards acting as a table of contents. In the absence of the iPad OS upgrade that enables multitasking, you can't even run a second app with these features at the same time. In most cases, though, you won't need these extras. The microphone is more than up to the task, and while the app is undeniably a one-trick pony, it's one that's been carefully thought out, from the easy exporting to the automatic keyboard silencing. It's an essential app for any meetings on your agenda, and one we can no longer live without.